Taking part in a Cross Bay Walk is an exceptional way to enjoy the stunning beauty of Morecambe Bay. Crossing is only possible at certain times of the year and under expert guidance. 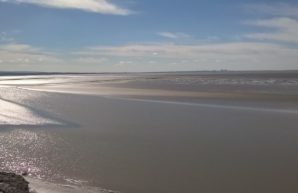 The Queen’s Official Guide to the sands will lead us across the biggest expanse to tidal mudflats and sand in the UK. We are asking everyone that signs up to raise a minimum sponsorship of £20 in addition to the registration fee (including coach transport to the starting point). All funds raised will be for More Music projects. We are a registered charity and not for profit company. By supporting us you are helping to bring people together and help to make positive changes for our communities. The walks are usually between 6 and 8 miles, depending on the route taken, and are suitable for children and adults who are comfortable walking for 3 – 4 hours. Due to the early start of our walk (9.30am from Arnside) the train from Kents Bank cannot be relied on to get you to the stalk of the walk at the allocated time, so we have organised a coach with pick up points (Morecambe & Milnthorpe). Please be aware that there will be water – at least knee deep – to walk or wade through and that there is uneven ground at the end as we reach Kents Back.